Despite it’s immense popularity and usage, the Kenyan phrase or slogan “Lamba Lolo” is still one of the most searched terms online. There have been conflicting meanings for the phrase but we can all agree that it is used as a sexual connotation. In fact, the phrase is said to have been coined by one DJ Brownskin as deejaying sound effect. “Lamba lolo is more of a slogan, and as a DJ who uses the popular ‘pull up the tunes’ and ‘kama ngoma inabamba wapi nduru’ sound effects, I came up with ‘Lamba lila lolo as my own sound effect,” Brownskin explained. However, no one can explain how a sound effect became a sexual act that involves mouths and private parts. What can be explained, however, is how “Lamba Lolo” is done thanks to the lovely ladies who serve commuters traveling in SGR trains. 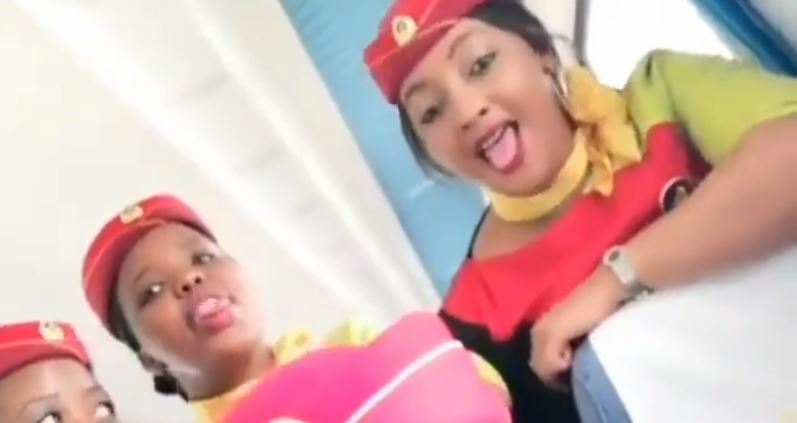 This after a video emerged online showing a group of five hostesses, dressed in their immaculate uniforms, showing Kenyans the art of “kulamba Lolo.” And they even seem to have a “Lamba Lolo” leader.